Hoboken Rock City - The Official Blog Of DJ Mike C.
Good news for Neat Neat Neat fans. The party's moving from one Wednesday a month to two Thursdays a month. For anyone who doesn't feel like doing the math, that's twice as much rock & roll, and on a sexier night. We're not wasting any time, either—it starts up next week on Thursday, April 20. For this first Thursday edition of Neat*3, I'll man the decks all night. Starting in May, look for guest DJs and tribute nights where I'll be playing extra heavy doses of your favorite bands. It's gonna be fun. Thanks to all who were there last week. And huge props to DJ Catskillz for her inspired guest stint; I hadn't heard that Afghan Whigs version of "Lost In The Supermarket" in years. Pics here. Party rocks till 4 a.m. Early set April 29: DJ Mike C.
I'm rocking another set at this weekly '80s party hosted by DJ Mister X. I'll spin dance rock & new wave faves from 10 p.m. to 11:30 p.m. The party happens every Saturday, but get there early on April 29 for my rare appearance. Don't tax your lungs—it's the first smoke-free night in NJ bars! 10 p.m. - 2:30 a.m. 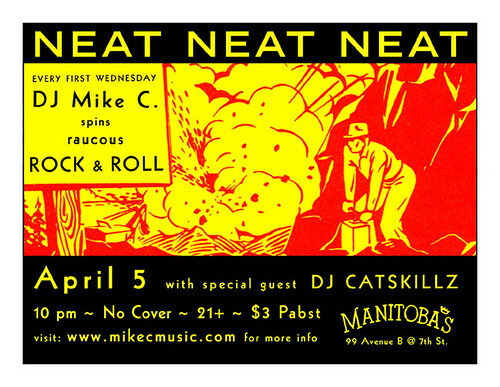 Hot on the heels of this past weekend's two-fisted rock & roll action at The Goldhawk on Friday and Saturday, the big April shower of hits rolls into the big city this Wednesday at Manitoba's for Neat Neat Neat. It's another installment of rock & roll night school, and this time DJ Catskillz will be putting her own stamp on the night with a special guest set. There's four more Goldhawk nights to go this month, as well as another set at Luke & Leroy for the Corrosion '80s party on Saturday, April 29. All pertinent info follows. Opening set April 29: DJ Mike C.
They gotta stop choking eventually. Law of averages. Subway series, anyone?